Another feather in the cap for Ford’s EcoBoost engineers. Their 1.0 liter 3 cylinder EcoBoost engine left supercars in its dust at the famed Nurburgring circuit. – Ford’s tiny but feisty 1.0-litre EcoBoost engine is the reason why a unique road-going Formula Ford race car has scored one of the fastest lap times ever at Germany’s famed Nürburgring Nordschleife circuit. The one-of a-kind, road-legal version of the latest Formula Ford single-seat racer completed the lap in 7 minutes, 22 seconds to register the 11th fastest time ever on the circuit – a performance that puts it ahead of a host of supercars including the 600+ horsepower Lamborghini Aventador, Ferrari Enzo and Pagani Zonda. Ford engineers have led several months of work on the project to switch the Formula Ford’s usual 180 PS,1.6-litre EcoBoost power unit with a specially tuned 205 PS version of the company’s new global 1.0-litre EcoBoost petrol engine, which was recently named “International Engine of the Year”. The project team also modified the vehicle so it would be fully street legal for on-road use by fitting it with wheel covers, front and rear lights and indicators, aerodynamically designed wing mirrors and a horn. The car is fitted with a 6-speed manual gearbox and was driven on road-legal tyres. The car’s unofficial top speed is expected to be 255.5 km/h (158.8 mph) with a 0-100 km/h (0-62 mph) time of less than four seconds. The vehicle completed the 20.832 km (12.94 mile) Nordschleife circuit at an average speed of 169 km/h (105 mph). 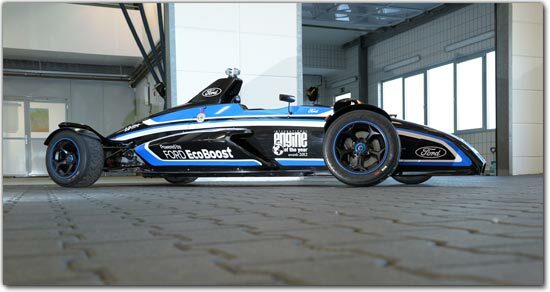 The 1.0-litre EcoBoost powered Formula Ford car beat previously recorded fastest times of many supercars including the 700 horsepower Lamborghini Aventador LP700-4, the 660 horsepower Ferrari Enzo and the 602 horsepower Pagani Zonda. No other three- or even four-cylinder car has posted a faster time at the legendary circuit. In-house testing also showed the 1.0-litre EcoBoost-powered Formula Ford is capable of extremely frugal fuel economy, delivering 2.4 l/100 km (118 mpg) at 56 km/h (35 mph), and 5 l/100 km (57 mpg) at 120 km/h (75 mph). While the 1.0-litre EcoBoost-powered Formula Ford car isn’t available to buy, the Ford Focus equipped with this engine is already proving a success with customers around Europe. About 30 percent of new Focus buyers in recent months have opted for the 1.0-litre EcoBoost. In the Focus, the 100 PS version 1.0-litre EcoBoost engine delivers 4.8 l/100 km (58.9 mpg), and the 125 PS model achieves 5 l/100 km (56.5 mpg). * The engine also will be available in the all-new Ford B-MAX, and C-MAX as well as the redesigned new Ford Fiesta coming later in 2012. About Ford Motor Company Ford Motor Company, a global automotive industry leader based in Dearborn, Mich., manufactures or distributes automobiles across six continents. With about 168,000 employees and about 65 plants worldwide, the company’s automotive brands include Ford and Lincoln. The company provides financial services through Ford Motor Credit Company. For more information regarding Ford and its products worldwide, please visit http://corporate.ford.com/. Ford of Europe is responsible for producing, selling and servicing Ford brand vehicles in 51 individual markets and employs approximately 66,000 employees. In addition to Ford Motor Credit Company, Ford of Europe operations include Ford Customer Service Division and 22 manufacturing facilities, including joint ventures. The first Ford cars were shipped to Europe in 1903 – the same year Ford Motor Company was founded. European production started in 1911.